Lake Tisza, the "Balaton of the Great Hungarian Plain" is the second largest still water of Hungary: the protected area is a paradise for birds and holiday-makers, as well. The 127 km2 water surface was artificially created in the 1970s. The lake and its region is part of four counties (Heves, Borsod-Abaúj-Zemplén, Jász-Nagykun-Szolnok and Hajdú-Bihar), it has varied and colourful wildlife and culture. The centre of the region is Tiszafüred: the first permanent wooden bridge was built here on the river, it was also famous for the production of saddles and pottery. 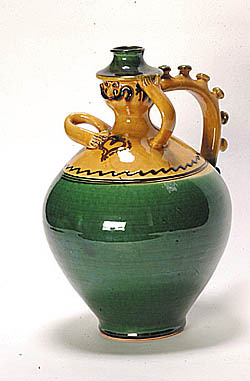 The so-called miskakancsó, a richly decorated jug forming a hussar is still being made. It is also worth visiting the neoclassical Lipcsey mansion, which houses the Pál Kiss Museum. Most of the Lake Tisza region including the bird reserve belongs to the Hortobágy National Park, which is part of the World Heritage. Its rare bird species such as the cormorant and the black kite can easily nest here. The lake and the dead channels of the river Tisza are rich in fish, in Hortobágy you can see grazing sheep and several non-water birds like the bustard or the tern breed here. The neighbourhood of Tiszaderzs is a popular hunting ground, while in the Botanical Garden of Tiszaigar you can find the most important tree collection of the region including bald-cypresses and mammoth trees. The region of the lake has been inhabited since the Neolithic age: in Tiszaszőlős treasures from the Copper age, while in Tiszaörvény the remains of a village from the age of the Árpáds were found by archaeologists. After the Turks had been expelled, Calvinist and Christian communities settled down in the uninhabited region. The Calvinist church of Kunmadaras was visited by Lajos Kossuth, too; the towers of Karcag and Kunhegyes can be seen from the puszta - or even from the top of the Cuman hills. Large towns of the region include the dynamically developing Tiszaújváros with its sports centre and thermal bath, and Karcag, the "capital" of Nagykunság. In the neighbourhood of the latter you can find typical inns of the Hungarian Plain such as Morgó and Ágota. Tiszafüred and Abádszalók have developed into a resort by now: in the beaches you can sunbathe on the side of the dam or you can even jet-ski, glide or take a paddle boat. The summer of Abádszalók offers a wide variety of music and sports programmes from June to August, but the Cherry Festival in Nagykörű, the Horse Days in Kőtelek, the Triathlon Championship in Kisköre or the fair on St. Stephen's day in Poroszló also await visitors. Those who prefer less busy leisure time activities can go sailing or rent a boat to look around in the lake. The lovers of water tours prefer the section between Poroszló and the dead channel of the river Tisza at Füred. You can also go on bicycle tours around the lake: e.g. between Kunhegyes and Tiszaörs, or you can ride a horse in the puszta of Nagyivány.